Native Americans used maple syrup to refine almost every food – today it is a popular sweetener in many parts of the earth. 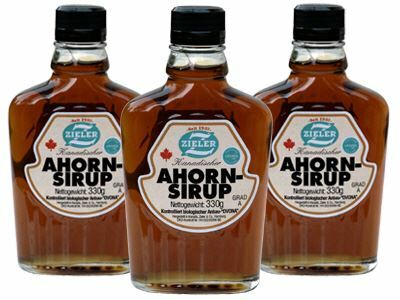 Firstly, maple syrup can replace regular sugar in almost all fields, secondly its delicious aroma is very popular to refine pancakes or crepes, waffles, pudding, muesli and pastry. Maple syrup is the concentrated juice of the maple tree in Canada and/or North America. The sweet syrup was very popular with the Native Americans, several legends have sprung up about its discovery. It is said, for example, that a Native America watched a squirrel licking a maple tree and thus became aware of this treat. Usually from February to April, the maple trees transport their nutrients from the roots through the trunk up into the buds. A part of the juice can be collected by slightly drilling into the trunk without harming the tree. The collected juice is then boiled which causes the sugar to caramelise, the juice to concentrate and the unique taste to be enhanced. Maple syrup is a purely natural product containing many vitamins and mineral nutrients. The classification “Grade A” stands for special purity and a high value of the syrup as well as for its mild and aromatic taste.